I have a Brother CS6000i sewing machine that my mother bought me for my birthday from Amazon. I am very happy with it, and I would recommend it to someone looking to start sewing. So, how do you thread a sewing machine? It's pretty much the same regardless of what machine you own. 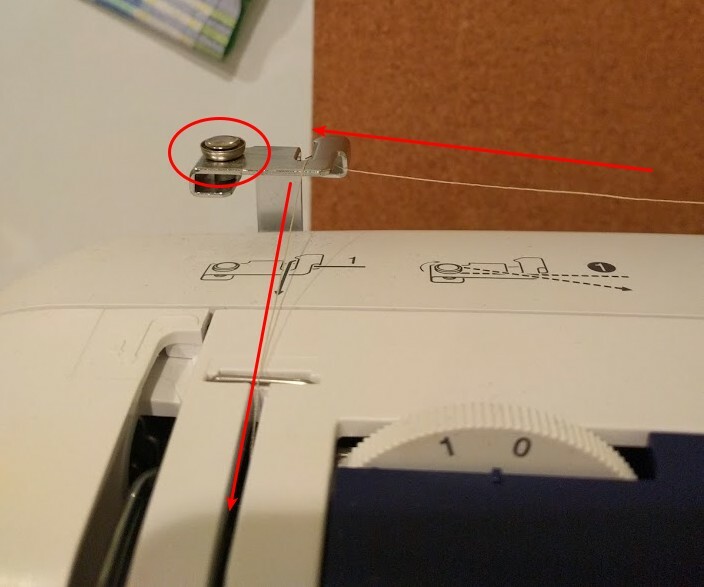 Start by loading a spool of thread on the metal rod at the top of your machine (the spool pin). Pull the thread towards the thread guide as shown in Figure B. 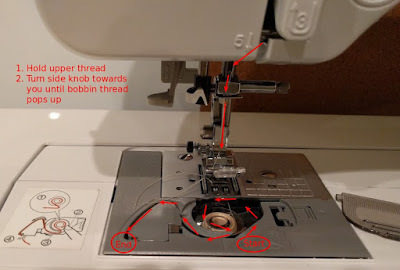 To thread your machine, follow the arrows; to load your bobbin with thread, you would wrap the thread around the knob that is circled in Figure B (instructions at the end of this post). 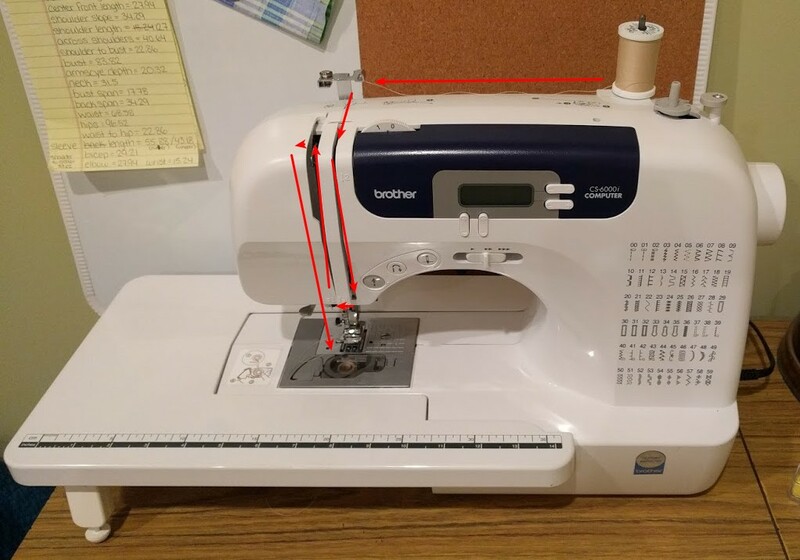 Figure C indicates the path the thread should then take, but before you do this, make sure the thread up-take (metal piece in Figure C on the upper middle left) is at its top most position. If it is not, twist the knob on the right side of the machine towards you until it is. Then, down-over-up-over-down as indicated. 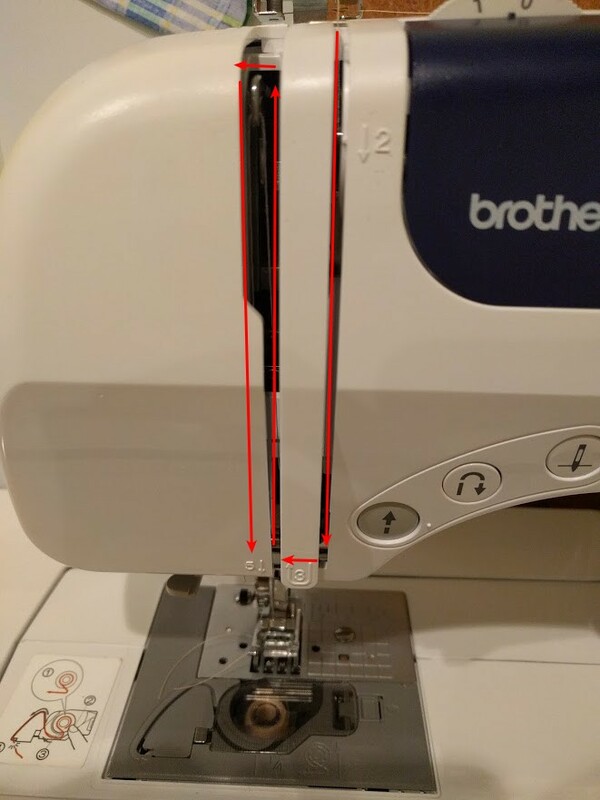 Figure D shows where the thread exits the thread guide. You will then pull it through the needle bar (located above the needle) and then through the needle hole. Note that some machines have self-threading and auto-bobbin threading features. Refer to your machine's manual for how to do this. Figure D also shows how to load the bobbin. When loading, you should always have your bobbin thread wrapping away from you or to the left. This is a constant regardless of the machine. My machine is a top loader, I place my bobbin in the bobbin holder with the thread wrapping to the left and then follow the arrows from Start to End as indicated by Figure D.
To finish threading your machine, hold the upper thread and twist the knob on the right side of the machine until your bobbin thread appears under the presser foot. Pull this out, and wrap both threads down under the presser foot and back towards the rear of the machine. You're now ready to begin sewing! press the foot paddle, and away you go! Wrap your thread around that knob I circled in Figure A, through the hole in the upper lip of your bobbin, and load it onto the holder located next to where you loaded your spool of thread (on my machine, it is the plastic gray piece in Figure A). Push this whole assembly to the right to lock it into place. Keep a tight hold of the end of your thread. Push down on your foot petal to begin loading the bobbin with thread, and stop after you have wrapped enough thread around the bobbin to secure the end of your thread. Cut the end off after it has been secured inside the bobbin. Continue loading your bobbin until it is full.